The SouthEastern Regional Meeting on Numbers (SERMON) is a series of conferences in number theory held annually at colleges and universities in the Southeast. It is held in coordination with PaNTS, a similar conference held twice in the fall of every year. The core members of the PANTS consortium are Clemson University and the University of South Carolina. We are grateful for support from the National Science Foundation, the National Security Agency, and the James Madison University Department of Mathematics and Statistics. Your web site, if you would like to have a link to your page from the on-line list of participants. Whether you would like to give a 20 minute contributed talk (please send the title and abstract by March 25). There is registration fee has been paid by the NSA. A form for requesting support is available, and copies will be available at the conference too. Please complete the form and submit it with your receipts at the conference, or shortly thereafter. Note that you must register as a vendor with Clemson University before payments can be processed. Please complete this registration before submitting for your reimbursement. Details appear on the form. 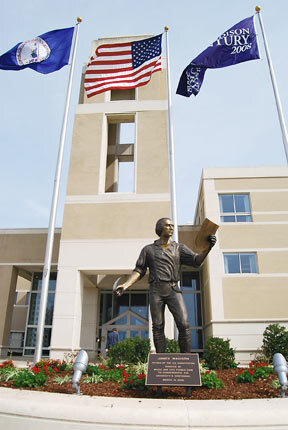 James Madison University is located in the heart of the Shenandoah Valley in Harrisonburg, VA. Situated along Interstate 81, the campus is approximately a two hour drive west from Washington, DC and a four hour drive north from Charlotte, NC. While there is a small airport, Shenandoah Valley Regional (SHD), 15 miles south of JMU, the best choices for air travel would probably be either Dulles International (IAD) or Charlottesville-Albemarle (CHO). From either of these airports, the most cost effective way to get to Harrisonburg would be to rent a car. Campus map. The conference will be held in the ISAT-CS building, 701 Carrier Drive. Parking lot D2 (parking map) is adjacent to the building. After parking, attendees should enter into the PHYSICS/CHEMISTRY building, make a right turn into the main hallway and then walk straight (through the HHS building corridor) to enter ISAT. The talks will be in ISAT 159 and ISAT 148. Here is Google Map of the area with important locations marked in. If you plan to request support, please share accommodations so that we can make the best use of grant funding. We have reserved blocks of rooms at the Hampton Inn (Harrisonburg University location) and the Courtyard Harrisonburg. - Hampton Inn - University (1.2 miles from SERMON) -- Group rate is $129 for a standard king or double queen room. You can reserve a room online by going to www.harrisonburguniv.hamptoninn.com and using the group code SER under "special rate codes", or you can call 540.432.1111 and ask for the SERMON group. The cutoff for the group rate is March 14. - Courtyard Harrisonburg (1 mile from SERMON) -- Group rate is $99 for a standard king room (includes sofa bed) or $105 for two queens. Group rate cutoff date is March 11. Link takes you to a site to book at the group rate, or you can call 540.432.3031 and ask for the SERMON group. Other local options: All of the following hotels are within two miles of the conference location, are near many chain food options, and several are within walking distance of each other or the conference site. Prices listed are the standard price from their corporate website; better deals are certain to be had on any discount site (Orbitz, Hotels.com, Priceline, etc). You can find information Harrisonburg restaurants at the Harrisonburg Downtown Renaissance. For more information, please contact the local organizers, John Webb and Cassie Williams. Last modified March 31, 2016.